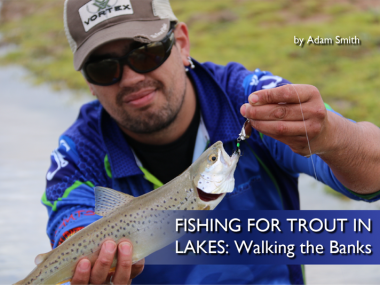 Last weekends above average September temperatures made for perfect fishing conditions. 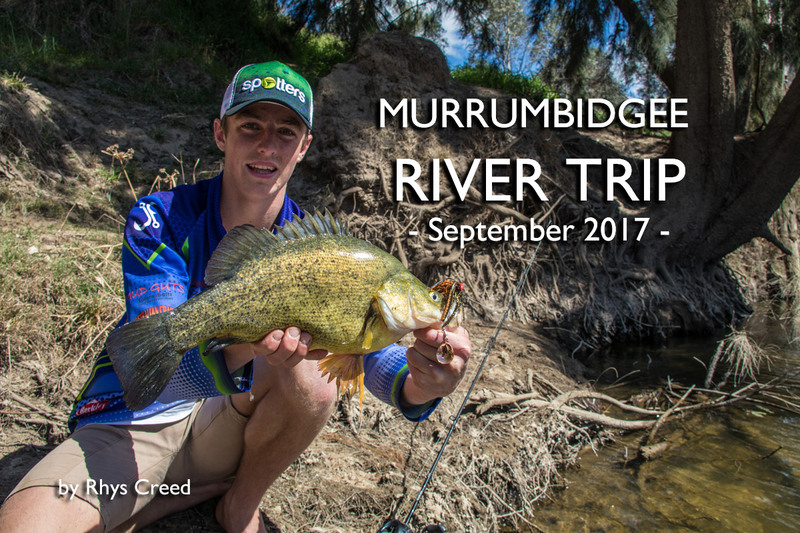 We spent the morning fishing the Murrumbidgee River in search of some resident Golden Perch and we weren’t disappointed. The fish were taking lures aggressively and we only missed a couple of hits. They were also hitting the lures early on in the retrieve which means they weren’t following the lure and most likely were attacking as soon as they spotted it. This is a great sign and means the fish are well and truly active after a long dormant period over winter. The Takacat Sport 300 is our go to small watercraft! Our vessel for the day was the Takacat Inflatable boat. 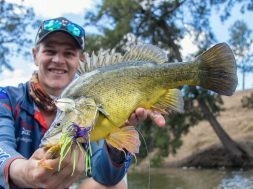 This is our favourite craft to fish from with excellent stability and they make for some really exciting, close quarter fishing. 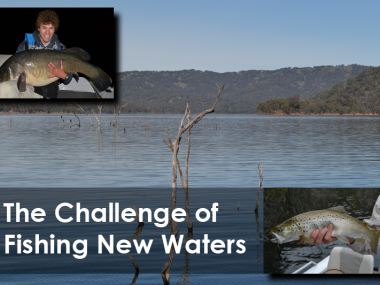 The fight from the fish is more intense with decent fish being able to dictate the boats path. The model we use is the Sport 300 and we have added customised decks which allow us to stand on top of the boat and cast away with an electric motor. 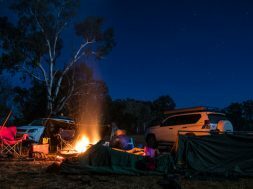 If you can’t afford a trailer boat or are looking for a better alternative to a tinny or kayak, check out the Takacats. Stand out lure was by far the 3/8oz Mud Guts spinnerbait. 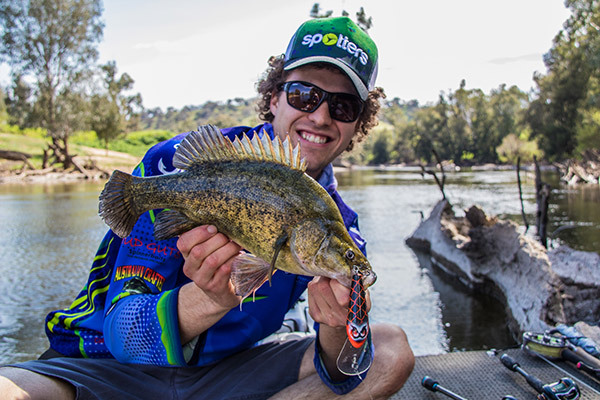 This spinnerbait is small and specially designed for Golden Perch and Bass and was our preferred choice as it is closed season for cod. Tallis decided to run with the spinnerbait and I started with a hard body. 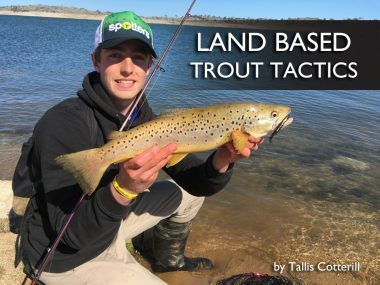 The reason I started with a different lure to Tallis is so that we could effectively cover the water. 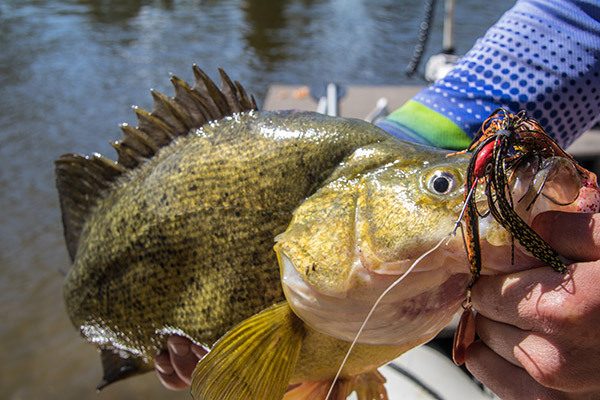 To explain in more detail; a spinnerbait is perfect for fishing tight in against structure as it can sink beside a log and into the strike zone. Where the spinnerbait really stood out above the hard body lure was in high light periods where the sun was penetrating directly onto the water. Whenever the structure we were fishing was in full sun the spinnerbaits still caught fish and the hard body didn’t raise any attention. This is because the fish were sitting right underneath the logs, in the shade and would only attack if the lure fell right on their nose. A hard body just couldn’t get into these areas. 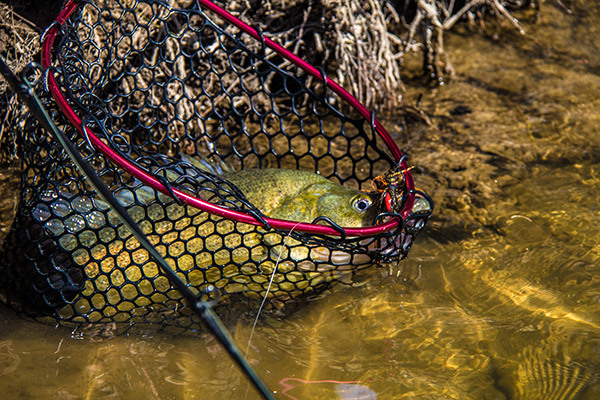 But… the hard body worked wonders above the spinnerbait in areas of thick shade that were loaded with timber beneath the surface. 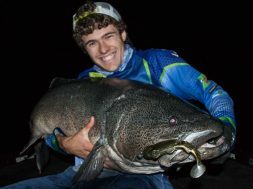 As a hard body can be retrieved much quicker than a spinnerbait and can search the area while still staying down in the strike zone. The hard body that I used was the Strike Force 80mm Cod Stalker. 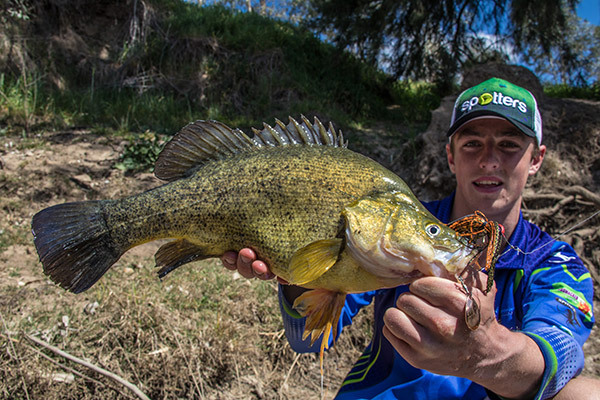 This lure is brilliant and catches just as many Golden Perch as it does cod. 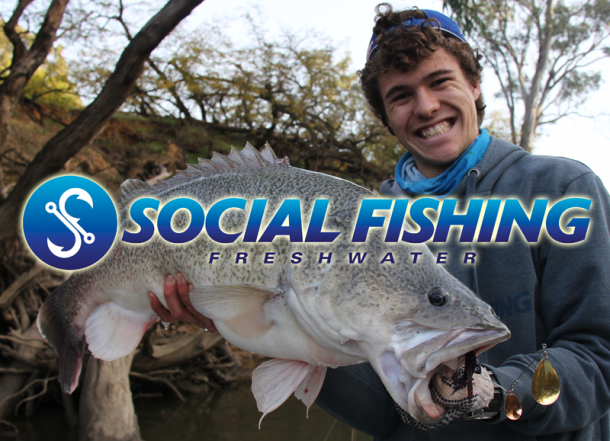 It’s 80mm in length and has a narrow end which provides an extremely positive hook up on Golden Perch. There will be a video coming out soon from our day on the water and you will see that when we are fishing in thick shade the hard body produced and when we are targeting the sunny areas the spinnerbait jumps back on top. 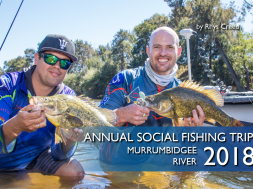 We did land a couple of by-catch Murray Cod which were released quickly back into the water. 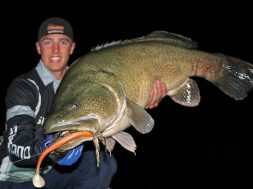 Catching Murray Cod is always going to happen when targeting Golden Perch, just make sure they are handled correctly and released back into the water as soon as possible. 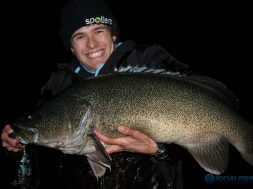 We downsized our lures with the small spinnerbait with tiny soft plastic tails but the Murray Cod still found them irresistible. 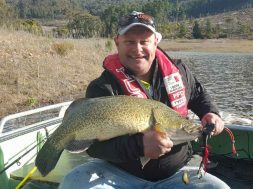 One thing we do is try to fish areas that are home to more Golden Perch but as always Murray Cod captures will always happen. Interestingly we encountered a couple of hybrid cod on the trip. 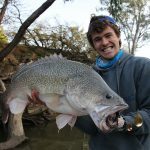 These fish are a cross breed between Trout Cod and Murray Cod. 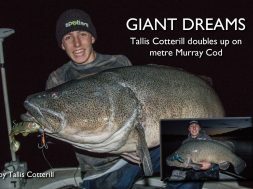 Sometimes they can be quite hard to distinguish and are normally mistaken for a Murray Cod. 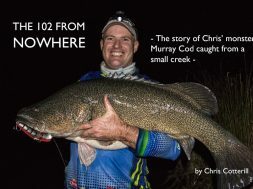 They usually have a body and tail of a Murray Cod and the head of the fish looks more like a Trout Cod. You can usually tell from the pattern on the head, gill plates and across the top of the back. 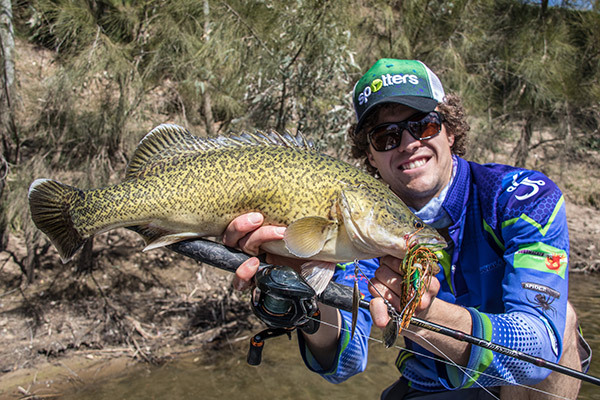 You can almost see the dot like pattern (associated with Trout Cod) change into the Murray Cod marble pattern. The wind picked up during the middle of the day which made fishing extremely difficult so Tallis and I were contemplating pulling the pin at about 1pm. We decided to give it a few more casts as the fishing had slowed off a bit due to the high sun. We approached a large boulder sitting out off the bank which casts a slight shadow on one side. I sent a cast with my 5/8oz Mud Guts spinnerbait past the rock to allow it time to sink into the strike zone (the shadow behind the rock). Once near the bottom I started to roll the lure back in and when it hit the middle of the shadow it was jammed by an aggressive fish. A few short pumps of the rod and the fish hit the surface. It was one of the Hybrid Cod I talked about previously, and these fish are extremely pretty with such beautiful marking and colours. The wind was getting worse and among the large gums I wasn’t keen to stick around, even though the fishing was good. Tallis wanted to get one more fish so I said we would keep going until the next fish. 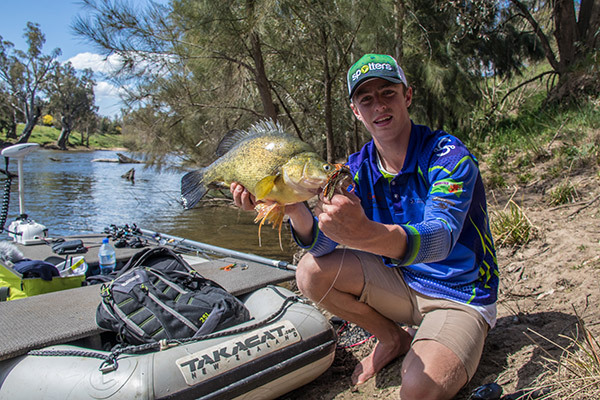 Well it took as little as it possibly could to find the next fish as I pushed the boat off the bank and Tallis casted back in against the rock. On the drop the spinnerbait was hammered by a solid fish that wanted to stay deep. 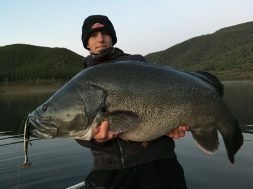 We couldn’t believe very next cast, in the same location and we were onto another fish. This fish popped up and it was our target species, a great Golden Perch coming in as the best fish of the day! This was the last cast and we headed home after a very successful half day session. All large waterways that are used for irrigation are starting to rise with water being needed for farmers. They aren’t too high yet and the fishing will be good until they rise. 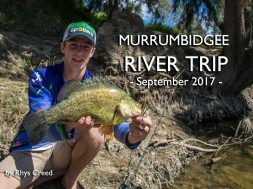 Now is a good time to be out on not only the Murrumbidgee River but all rivers that hold Golden Perch. If there is a bit of flow in the river be sure to target the slow pockets in behind logs and structure and also try to find the wider and deeper sections of rivers as the flow will be slower in these areas. An even better area to target are the perennial creeks and river that only flow from the rainfall. These will be low and fishing really well.